Serbia's Novak Djokovic celebrates during his first round match against Brazil's Rogerio Dutra Silva. 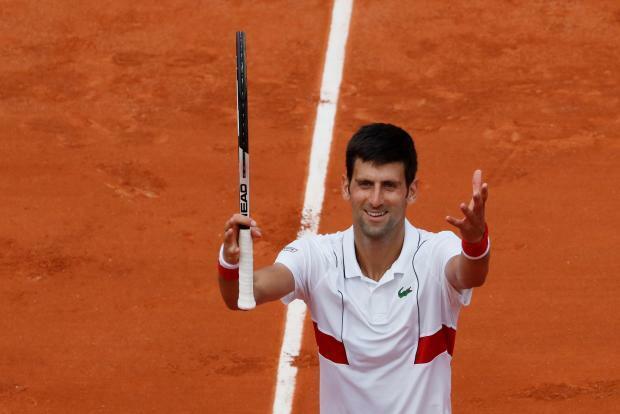 Novak Djokovic launched his campaign for a second French Open title with a moody victory over Brazilian qualifier Rogerio Dutra Silva on Monday, winning 6-3 6-4 6-4. In his quest to become the first men's player in the Open era to win each of the Grand Slams twice, Djokovic, who underwent surgery on his elbow after January's Australian Open, looked unhappy even when he was stroking winners past his opponent. "You don't always get to feel your best but all you can do is try and get the best out of it," the Serbian told a packed Philippe Chatrier court. Djokovic, who didn't play a competitive match between Wimbledon last July and Melbourne, endured a tough run into Roland Garros. He fell in the second rounds at Barcelona and Madrid before reaching the semi-finals in Rome, where he was defeated by world number one Rafael Nadal. Djokovic has never lost to a player ranked as low as Dutra Silva at number 134, but the claycourt specialist pushed his opponent around the court drawing frequent outbursts of frustration from the Serb. "He's a fighter. It was a good test for the first match," Djokovic told a news conference. The 2016 Roland Garros champion said he felt he was beginning to play better and free of pain after "a long 12 months". This year is the first that Djokovic has not won a tour-level title prior to the French Open. Asked if the tour was too demanding on players he replied: "The fact is we have the longest season of all sports and that is unfortunately hurting a lot of players. "We all try to be fit, get our bodies and mind in the best possible state so we can always compete at the highest level but it's not always possible." Djokovic faces Spain's unseeded Jaume Munar in the second round. The most recently minted Grand Slam champion in tennis booked her second round French Open slot on Monday as Caroline Wozniacki overcame a stuttering start to beat Danielle Collins 7-6(2) 6-1 in Paris. The Dane, who landed her first major at the Australian Open earlier this year in what was her 43rd Grand Slam attempt, generally prefers faster surfaces, but looked increasingly at ease once she had ironed out some early glitches. Collins, coming into this tournament on a career-high ranking of 42, fought throughout but was unable to hold off Wozniacki who won on a bizarre point after the umpire ruled a Collins shot had been long while the American, her back turned, was preparing to play on. Seeded two here, Wozniacki is one of six players who could end the tournament world number one.